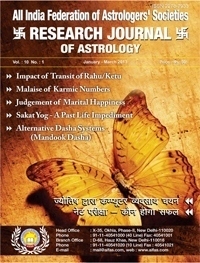 The numbers that indicate a Karmic Debt are 11/2, 19/1, 13/4, 22/4, 14/5 and 16/7 and are called Karmic Numbers. These numbers takes on great significance when they are found in the Core Numbers i.e. the most important numbers like Talent Number, Destiny Number, Heart Number, Personality Number or in the Challenges, Pinnacles, Event Numbers, Personal Years or Birth Force Periods during the course of our life time. Each has its own unique characteristics and its own particular difficulties. A Karmic Number can be found in different places in the chart as a result of totals based on date of birth or calculations based on the letters of name. Numerology is based on the ancient idea that each of us is a spiritual being or a soul who incarnates on the earth many times in order to further evolve towards higher states of awareness. During our long evolutionary path of many incarnations, we have accumulated a wealth of wisdom and have made many good choices that benefit us in future life times. We have also committed mistakes and have sometimes abused the gifts we have been given. To rectify such errors we may take on additional burden in order to learn a particular lesson that we failed to learn in previous life times. In Numerology, this burden is called Karmic Debt. Number 11/2 : Number 11 walks the edge between greatness and self destruction. Its potential for growth, stability and personal power lies in its acceptance of intuitive understanding and of spiritual truths. For Number 11, such place is not found so much in logic but in faith. It is the psychic’s number. This number signifies a grave warning of hidden dangers, trial and treachery from others. Immense sensitivity, tension, impracticality and selfishness are its negative features. The people having this number specially as Talent Number have the tendency to force their views on others irrespective of their desire which prove fatal. It has been observed that if this number appears as Core Numbers specially as Talent Number, the person either remain unmarried or face marital problems leading to divorce and immense ups and downs throughout the life. Adolf Hitler and Benito Mussolini are the prime examples. Both were under the negative influence of Number 11 and their acts are well known to the world. Number 19/1 : Karmic Number 19/1 is the result of the inclusion of the negativity of 1 and 9 i.e. selfishness and proud of 1 and misuse of ability and much ambition. The person having this Number always gets ample opportunities in life but due to problems and obstacles he is not able to take the advantage. He always finds it difficult to use his ability in right direction and so fell to harness the opportunity. They always suffer from the hands of their near and dear. They don’t like to listen to others or to accept the help and advice of others. Number 13/4 : The people having this number as Talent Number or other Core Number have to work very hard to accomplish any task but with poor result. Obstacles stand in their way and they often feel burdened and frustrated by seeming futility of their efforts. Very often people with 13/4 Karmic Number do not concentrate or direct their energies in one specific direction or on a single task but scatter their energies over many projects and jobs, non of which amount to very much. A temptation with the 13/4 is to take shortcuts for quick success. Too often, that easy success does not come causing regret and the desire to give up. The result is a poor self –image and the belief that one is incapable of amounting to very much. Number 14/5 : Karmic Number 14/5 arises from previous life times during which human freedom has been abused. Those with a Karmic Number 14/5 are forced to adapt to ever-changing circumstances and unexpected occurrences. There is an acute danger of falling victim to abuse of drugs, alcohal and over indulgence in sensual pleasures. The people having this number as Talent Number or other Core Numbers have the tendency of too much changeability, love of freedom and movement, involvement in sloth and sensualities. They always aspire to have different partners and always seek pleasures at the cost of self destruction. They also don’t like to stick to one particular job or profession and quite frequently try to change without any specific reason which brings troubles for them. Number 16/7 : Number 16/7 is the manifestation of negative 1 i.e. selfishness and egotism and negative 6 i.e. illicit love affair in the form of negative 7 in present life. Indifferent attitude and introvert nature alienate the people from the mass. As a result marriage and business are totally destroyed and could not be saved. Power, authority, honour, dignity and material accumulation suddenly get vanished. When 16/7 is one of the Core Numbers, this process of destruction and rebirth is a continual cycle that actually serve to bring into higher consciousness and closer union with the source of life. Karmic Number 16/7 can be a path of progress and great spiritual growth if it is looked at properly. It has been observed that people having this number as a Core Number have to face sudden ups and downs in every sphere of life at different junctures specially their married life is disturbed and they have several illicit love relationships.